Welcome to Gallo Property Inspections! We offer free advice to all our clients with regards to any issues they may face regarding their property. Each of our Inspectors has the relevant experience within the building industry to ensure you are fully informed on the condition of the property. We hold both Professional Indemnity and Public Liability Insurance at a level to protect our mutual interests. Before you buy the house, let us inspect it. It will put you in a far better negotiating position. Home owners note: Insurance does not cover damaged caused by Termite or Pests. Take advantage of our two-in-one savings, our most popular Inspection service. Be sure of what you are buying before you bid! Remember you can’t have an inspection after the auction. Tell your buyer of any issues with the property and so build confidence with them. Minimise the frustration of getting any repairs completed once your keys has been handed over. There are very few investments in our lives which measure up to the importance of our homes and property. We attach a great deal of emotional importance to these assets; more than this, we attach a great deal of our savings throughout the purchase and sale process. When things are so serious it pays to have a reliable, experienced firm like Gallo Property Inspections involved to help keep negotiations steady. When it comes to property inspections Melbourne and surrounding areas, don’t wait, give us a call today. Additionally, if you have questions about house inspections in Melbourne or in general, property inspections in Melbourne, we would love to help you. Excellent house inspections in Melbourne by Gallo! 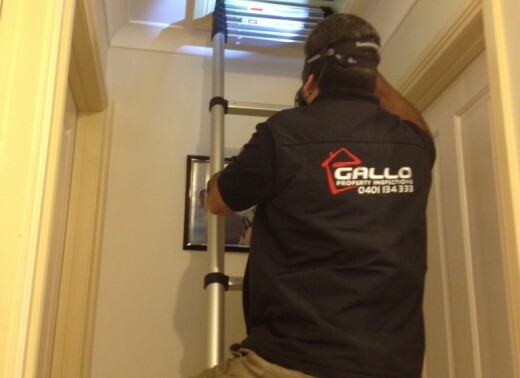 Melbourne’s premier team of house inspectors…Gallo have been conducting house and apartment checks around Melbourne for years, at the behest of buyers, sellers, agents, investors, and many other parties with a noted interest in the quality or value of buildings. Our house inspections are always carried out by an experienced and capable inspector, equipped with the very latest tools and techniques for evaluating property values. We will track down any inconsistencies, hidden flaws or specific concerns in the property and report back to you so you have all the information you need before negotiating a real estate transaction. Never buy, sell or build without calling in a house inspection or property inspection from us! A professional inspection is essential to help settle concerns about the value of a home before any sort of real estate transaction. No matter what your role is in that transaction, you can only benefit by getting a more complete idea of the condition and value of the estate before continuing on with it. Gallo Property are the proven Melbourne house inspection experts in all such situations; call us for pre-purchase & pre-handover of new construction or renovation work, or pre-sales to get ready to put your home on the market. House and Apartment inspections can help find problems before they cost you, Even if you aren’t currently preparing to buy, sell, or renovate your house, our trained inspectors can still help you. Knowing what your property is worth, and what you might be able to do to raise that value, is still incredibly useful knowledge and can influence your financial strategy and mid-to-long-term plans. Our thorough work can even help you root out potentially damaging infestations of termites and other pests; just ring 0401 134 333 and ask about our combined building and pest inspections. You can also submit enquiries through our online contact form, or email them to support@gallopropertyinspections.com.au. We’re ready to help you find the real value of your property any time. Call us for a property inspection in Melbourne and surrounding areas today: 0401 134 333. Our fees are amongst the most competitive in the area whilst our professionalism and expertise is second to none. If you are the slightest bit unhappy with any of our services, call us immediately on 0401 134 333 and let us put it right. Just ask us if you are unsure about anything – we are there to help your purchase progress as smoothly as possible. We service all of metro Melbourne and outer suburbs. Be sure to send us a quick message and we’ll be sure to contact you right away.